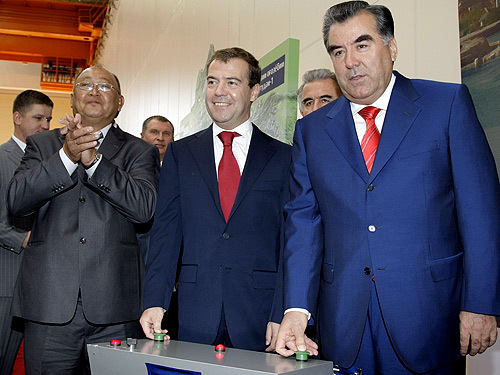 The Russian and Tajik presidents Dmitry Medvedev and Emomalii Rahmon simultaneously pushing the symbolic start buttons during the commissioning ceremony of the Sangtuda 1 Hydroelectric Power Plant in Tajikistan. This image is available under a Creative Commons Attribution 3.0 Updated license and was provided by the Russian Presidential Press and Information Office. A young researcher’s arrest in Tajikistan has sent shock waves across academic communities in North America and Europe. Alexander Sodiqov, a University of Toronto PhD candidate in political science, was detained on June 16 by the Tajik KGB while he was conducting academic research in the country’s Gorno-Badakhshan province. Mr. Sodiqov was travelling in the region with the project’s principal investigator Dr. John Heathershaw, a senior lecturer in international relations at the University of Exeter. There are local media reports that suggest Mr. Sodiqov, who has also worked as the Central Asia editor of Global Voices, could face high treason and espionage charges. Gorno Badakhshan Autonomous Province (GBAP) lies along Tajikistan’s long and mountainous border with Afghanistan. A majority of the province’s 250,000 residents belong to the Pamiri people, an ethno-religious minority group that, unlike Tajikistan’s predominantly Sunni Muslim population, practice the Ismaili Shia Islam. During the Tajik Civil War (1991-1997), the Pamiri people fought against the central government, and to this day remain stern opponents of what one observer of Tajik politics aptly labels as a “chauvinistic dictatorship”. The government, in its turn, has tried violently to gain control of the province and drive out the remnants of autonomy in an otherwise strictly managed country. Precisely how authoritarian regimes such as Emomali Rahmon’s are able to stay in power remains a subject of lively academic debate. However, the following factors appear to explain most cases of authoritarian success and failure in the post-Soviet space. To withstand the increasing domestic pressures, authoritarian regimes need to achieve some economic growth, enhance (or at the very least, prevent the erosion of) their coercive/repressive capacities, and avoid alienating major powers. While in countries such as Turkmenistan, Kazakhstan, and Azerbaijan, the autocratic regimes seemed to achieve all three goals largely thanks to increasing their revenues from hydrocarbons exports, other relatively resource-poor economies such as Tajikistan and Uzbekistan, have benefited from the post-9/11 geopolitical changes – particularly, their geographic proximity to Afghanistan. In Tajikistan’s case, the aid provided directly to the security forces by the United States (close to $200 million over the past decade), has allowed Rahmon to build a better-equipped national security force which is probably the most important short-term factor for the survival of an authoritarian regime. Nonetheless, hydrocarbons and the geopolitical advantage are quite volatile resources. For instance, once the U.S. withdrawal from Afghanistan is completed, Rahmon will receive dramatically less backing from Washington. (Indeed, the security assistance has already begun to fall, and we can expect more critically- worded State Department statements to follow.) Given that a remittance-dependent, heavily monopolized economy will not suddenly turn into a wealth-generating machine, the authoritarian regime has to find other ways of offsetting the changing balance. Once viewed through the lens of the changing geopolitical and economic dynamics, the escalation of tensions in Badakhshan and, more widely, the intensifying of attacks on civil society in the rest of Tajikistan begin to appear as parts of a general pattern. The aim is to incapacitate the segments of opposition that can cause problems when the state’s repressive capacity begins to fall in connection with the declining financial resources. This kind of strategic calculus is not unique to the Tajik regime. A similar process is taking place in other parts of the post-Soviet Eurasia. For instance, in Azerbaijan, the falling oil revenues, the imminent end of America’s Middle East missions, and the possibility of improved relations between Washington and Tehran, have lead the Aliyev regime to start a new wave of repressions. Moreover, when autocracies embark on new campaigns of repression, they try to isolate those who are about to be crushed – e.g., the opposition and civil society activists – from the rest of the population as much as possible in order to minimize the wider repercussions of political violence. One prevalent way of doing this is to create an illusion of an outside plot. Foreign powers are conspiring to undermine the nation’s stability, and the growing numbers of arrests, stricter penalties are consequences of the state’s attempt to overcome the plotters, the familiar line goes. The stronger the propaganda machine, the more convincing such explanations appear. Over the last few years, Tajikistan has been doing precisely this. The authorities have become more vocally critical of the Western powers just as they have been ramping up their own attack against civil society. Britain, in particular, has been singled out for a reason – it would not make sense to accuse the U.S., a country that has given close to 200 million dollars to one’s secret police force over the last decade, of wanting to undermine stability. Thus, the Rahmon regime has tried to blame the re-eruption of violence in the Gorno-Badakhshan province in late May on the U.K. government. Subsequently, the U.K. ambassador’s visit to the Province was blocked by the Tajik officials. In a particularly dramatic incident, the Tajik police watched on as a crowd threw stones at the British Embassy, and caused material damage to the building. Following his arrest, Sodiqov has been detained incommunicado, paraded on local television channels,forced to read out a rambling confession statement, denied access to the lawyers of his family’s choice, and publicly condemned by the Tajik officials for belonging to some obscure international plot to overtake the country. All of these attest to the process being political theatrics rather than a genuine legal process. Given the local and international sensitivities surrounding the case, had Sodiqov been involved in any criminal activity, the government of Tajikistan would have tried to conduct the process in a transparent way so as to minimize the impact of the arrest on the country’s already tarnished international reputation. This is not the first time a post-Soviet dictatorship uses the treason, espionage, or other subversion-related articles (alongside, tax-evasion, narcotics, and, most ironically, corruption) from its penal code to deter citizens from criticising the regime or raising awareness about its human rights abuses. For a very long time, the subversion-related articles of the criminal code have been hanging over the heads of independent journalists, bloggers, and activists like the sword of Damocles. To give the spy fiction some semblance of “legitimacy”, the subversion charges are often used selectively against the critics that belong to ethnic or religious minority groups. However, in many other cases, these regimes do not shy away from appearing outright absurd even by their own standards. For example, only two years ago, the Tajik regime jailed a BBC journalist on terrorism and extremism charges after he had interviewed the members of an Islamic group. In another move that could arouse the envy of political satirists, Turkmenistan charged the country’s Grand Mufti (the highest religious official in any Sunni Muslim country) Nasrullah ibn Ibadullah with treason after he refused to display the Ruhnama (the book of spiritual and moral guidance written for the people of Turkmenistan by their late dictator Saparmurat Niyazov) in the nation’s mosques. The dictators’ aim is clear – to expand the definition of espionage and treason in ways that would shield them and the corrupt power networks over which they preside from all kinds of domestic and international criticism. An ideal situation for an authoritarian government would be one in which the regime is able to cast any criticism of itself as an instance of treason or espionage, hence obviating the need to window-dress these cases. This situation would be second-best only to the dystopian scenario of no such criticism ever being voiced. Sodiqov’s case not only does fit the general pattern of using subversion charges for political expediency, but it also represents a dangerous attempt to expand the definition of subversion in the above described fashion. Once the new definition takes hold, the regime would be able to denounce any kind of academic or journalistic activity as spying. After all, if interviewing a local activist about the impact of civil society on the resolution of a local conflict is tantamount to treason and espionage, what room does the new definition leave for any kind of social and political research other than the projects directly sanctioned by the government itself? Equally troubling is that if the government gets away with Sodiqov’s unjust incarceration, the example will send a clear message to the similarly situated individuals: Citizens of Central Asian autocracies will be scared away from taking on research contracts, translator jobs with international groups, intergovernmental organizations and NGOs. For a number of reasons, Alexander Sodiqov’s unlawful detention should concern us – citizens of Western democracies – and our governments no less than those who live under the post-Soviet dictatorships. First, with the exception of Belarus, all of these autocracies continue to benefit from direct aid and/or economic cooperation with the West without being subject to any systematic measures to curtail the spill-over of economic growth into repressive capacity. It should worry us that all of the resource-rich and/or geostrategically important ex-Soviet republics have expanded their repressive capacities over the past decade, to an important extent, as a by-product of their political-economic cooperation with the western liberal democracies. Secondly, there is the obligation to act in defence of academic freedom, which is inextricably linked to other fundamental freedoms that underpin a functioning democracy. However, as Sodiqov’s case reveals, this freedom cannot be defended solely within individual states, with each government taking care of only its own researchers. At a time when research networks operate in a transnational framework (e.g., almost all reputable scholarly journals have international advisory boards, and there is a constant flow of researchers across political boundaries), and governments benefit from such an internationally generated scholarship, the responsibility to act in defence of free academic research, clearly, should be as transnational as the modern academe itself. Thirdly, Alexander Sodiqov’s arbitrary detention is not just a serious human rights violation against an incredibly talented young man and his family (including his toddler daughter), but it also represents a new crisis point in the region’s slide towards a bleaker, more ruthless authoritarianism. Political, historical, linguistic, and cultural ties between these regimes –despite their political and economic rivalries– have allowed them to learn from each other’s experiments, successes and failures. Unfortunately, this mode of social learning among dictators and their advisors, seems to have become an effective and important part of their survival toolkit. Therefore, if democracy-promoters in the region fail to secure Sodiqov’s release, we can expect a new wave of repression against independent scholars in the post-Soviet space. With their increasingly more restrictive visa policies, countries such as Turkmenistan, Uzbekistan, and Azerbaijan have already made it difficult for international researchers and journalists to visit, let alone conduct in-depth research. This increases the importance of independent nationals, who in virtue of their citizenship cannot be denied entry, but who by the same token, are disproportionately more vulnerable to harassment. This brings us to the question of how the international community can and ought to react against these transgressions. As Edward Schatz reminds us, unlike the more confident rights-abusers such as China, Russia, and Iran, the smaller, poorer, and more aid-dependent countries such as Tajikistan “would rather not assume the reputational risks involved in alienating the global community”. In Alexander Sodiqov’s case, the U.S., U.K., and other O.S.C.E. member states need to explain clearly to the authorities in Dushanbe that such gross violations of human rights will have discomforting consequences for the regime members in terms of reduced foreign aid, international asset freezes, travel restrictions, etc. To be sure, some analysts have claimed that taking a tougher stance on dictators such as Tajikistan’s Rahmon could in the long-run prove counter-productive – e.g., these regimes could drift toward Russia. However, the experience of the past decade suggests strongly that the soft approach, and pretending that it is business as usual, can only deepen authoritarianism in the region, hence cementing Russia’s influence. This article was originally written by Aslan Amani and appeared on opendemocracy.net, it has been published here under a Creative Commons Attribution-NonCommercial 3.0 licence.